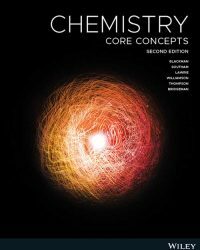 The second edition of Chemistry: Core Concepts, 2nd Edition (Blackman et al.) has been developed by a group of leading chemistry educators for students entering university with little or no background in chemistry. It presents the core concepts in chemistry at a pace that is accessible for those studying chemistry for the first time, and at a level that will enable you to build confidence and achieve success in your university chemistry studies. Available as a full-colour printed textbook with an interactive eBook code, this title enables every student to master concepts and succeed in assessment, with features designed to get the most out of learning by taking the roadblocks out of self-study. Lightboard videos of worked problems from trusted educators that engage you in a meaningful way while breaking down the more challenging concepts into bite-sized chunks. Concept reviews, interactive worked examples, visualisations and knowledge check questions in-situ allow you to review, practice and apply what you’ve learnt.